Jaden’s Quinoa Fried Rice inspired me to make Pork Fried Quinoa with some leftover pork roast. I cooked the quinoa early in the day so I could refrigerate it, but Jaden suggests a method if you’re in a hurry. Simply cook the quinoa, spread it out on a tray, and put it in the freezer for 10 minutes. That will quickly cool it so it’s ready for the recipe. This is actually quite similar to my Pork Fried Rice recipe, but this one uses fish sauce instead of oyster sauce. Both versions are good. There’s a lot of room for improvisation with this recipe. Use 6 ounces of another cooked protein; ham (which Jaden used), chicken, beef, or shrimp would all be great. Use 2 cups of cooked and chilled rice instead of the quinoa, if you prefer. Bob and I really liked this Pork Fried Quinoa. He added several generous splashes of Sriracha sauce to his and declared that it was quite good. Serve it with Sriracha or your favorite hot concoction if you are dining with someone who likes it hot. 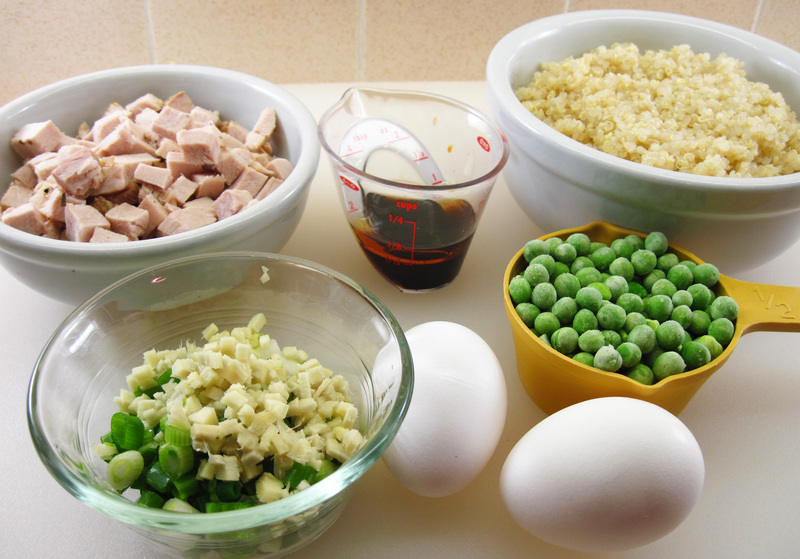 Ingredients for Pork Fried Quinoa. The soy sauce, fish sauce, and sesame oil are all combined in the 1/4-cup measuring cup. 1. Heat a large skillet (or wok) over medium heat. (A well-seasoned 12-inch cast iron skillet works great!) Add the oil to the hot pan. Add the eggs and scramble gently until cooked. Remove the eggs from the pan. 2. Add the pork and cook for a couple of minutes. Push it aside and add the green onions, garlic, and ginger. Stir fry until fragrant, about 30 seconds and then stir the pork in. 3. 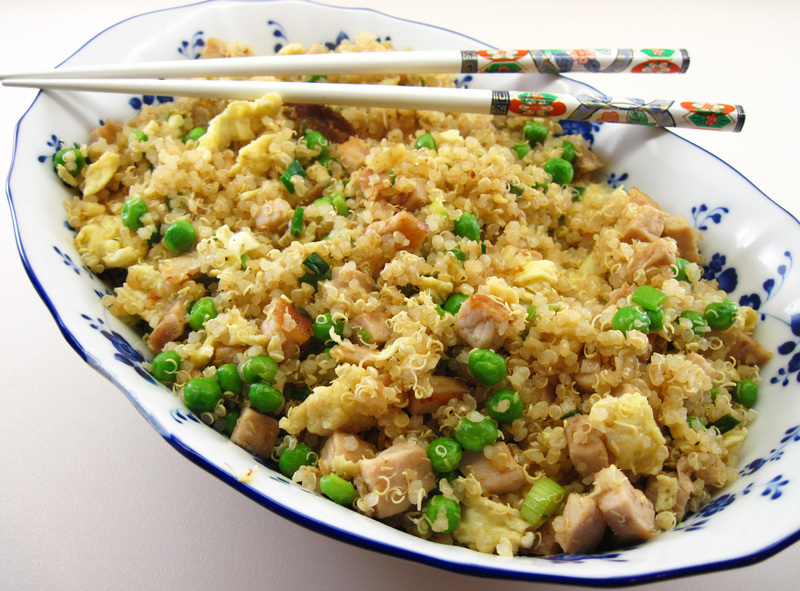 Stir in the reserved cooked eggs, peas, and quinoa. Stir fry for a couple of minutes. 4. Add the soy sauce, fish sauce, toasted sesame oil and a few grinds of black pepper. Cook, stirring for another minute or so. 5. Taste, and add a bit more soy sauce and/or fish sauce if it seems to need more salt. I think this will be the winter I try cooking quinoa! I love quinoa and what a perfect way to prepare it. Thank you! what a cool idea! why have i never thought of using quinoa instead of rice in a dish like this? simple, but brilliant.